My sister spent the past two weeks with us in Berlin. She works in Melbourne, halfway around the world. To think that she would come all this way to spend time with us was a marvel. With her I finally allowed myself to be a tourist in this town. We went on a chilly Fat City bike tour of the city; we went to the Bauhaus Archiv. We visited the Topography of Terror exhibit about the Nazi era; we went to the DDR Museum exploring the trials and tedium of life behind the Wall. 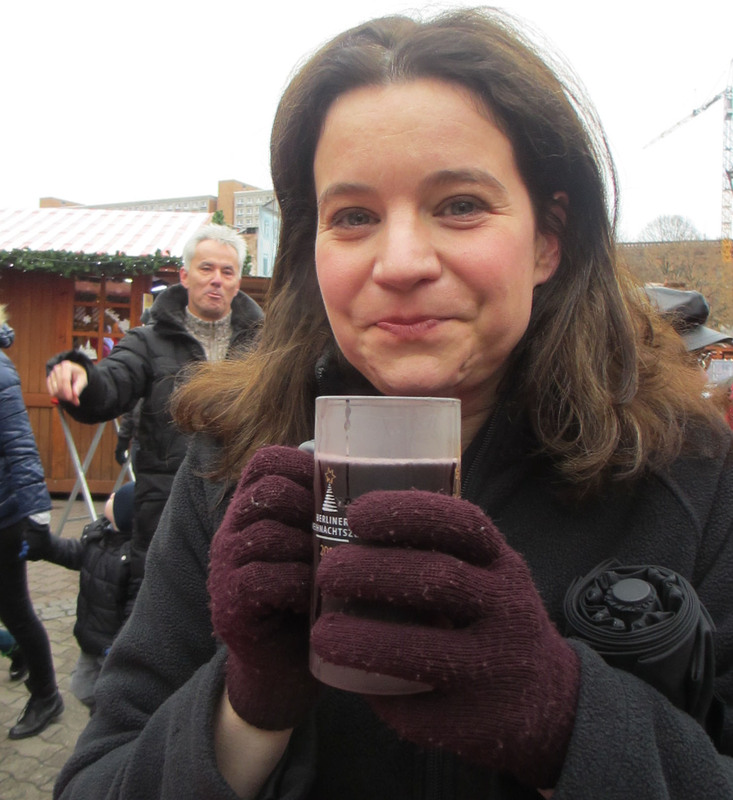 Getting to that last site was a journey in itself, involving Christmas Markets and a little midday Glühwein. We set off from the flat just after lunch with a street map and a subway map between us. Deb said she had a good idea of where the museum was, and so I gladly followed her lead, and we walked to Nollendorfplatz to catch the U2 train to Alexanderplatz. So far, so good. The Alexanderplatz train station is massive; it’s a bit of a hub and serves many other incoming U-Bahn lines, and offers access to many buses. There are so many hallways you can take to exit the station. We probably chose the best one based on where we wanted to go, but when we popped up on the street and looked around, we did not recognize which street to take from there. Deb had her head buried in the street map. “I love maps!” she said, as she had a few times during our visit, and I believe her. She had gotten us to the Bauhaus Archiv without even consulting a map once we left the flat; she had our trek figured out to the Topography of Terror site near Checkpoint Charlie that we had seen the day before, but today the map, the DDR Museum and Alexanderplatz were a holy jumble. We both stood outside the subway station looking at the map, trying to orient ourselves based on where the large TV Tower stood ahead of us. “I think we should go this way,” she said, pointing to our left. “Oh… I thought we were supposed to go that way,” I said, pointing to our right. We laughed, shrugged, turned right, and started walking. We walked smack into a collection of wooden huts that I now know as a Christmas Market, a smallish one, as we headed for the next street sign, which in the cold and driving wind, seemed rather far away. We left the market behind and found the street sign, which was not the street we’d expected it to be. Out came the map again, and we stared at it, and turned it this way and that, and agreed that our destination was likely across the square entirely, so we put the map away and crossed the wide, barren platz. The wind was really whipping now, and Deb was shivering in her fall jacket. It’s summer in Australia, and their winters are not severe, so she was not entirely prepared for the damp chill of Berlin. We crossed the square, but we still seemed to be no closer to where we wanted to go. We turned left now, heading back the way we came, only on the other side of the massive, windswept platz, and we saw the Marienkirche up ahead, a stately old church built in the 14th century, with the top half of newer, postwar construction. “I’m pretty sure we go through this park,” said Deb, and though I wasn’t so sure, we cut into the park that turned out to be a much larger Christmas Market going full tilt at 1 p.m.
Have you ever encountered a German Christmas Market? Imagine taking the Minnesota State Fair’s empty booths and scattering them across the Twin Cities. Put a bunch in Rice Park in downtown St. Paul. Line some up along Nicollet Mall. Arrange some in St. Anthony Park, and another group in Phalen, and so on, in all your favorite neighborhoods. Then fill them with food and gift vendors through the month of December, the season of Advent, that is, and voila, you have Christmas Markets. Here at the Alexanderplatz Weihnachtsmarkt was a Ferris wheel spinning above us, and there were donkeys for children to ride. There was a smith in a leather apron banging out metal, and children were ice skating around a sculpture in the middle of it all. And there, like a beacon in the gloom, was a Glühwein station, a wooden hut with a bar set up, and another hut with tables and chairs. Deb and I looked at each other. “What the hell,” one of us said, and we each ordered one, splurging on the heated, spiced red wine with a shot of amaretto, and it was smooth and sweet and hot and somehow what the moment called for. We sat on the wooden seats in the small hut, surrounded by Germans also nursing Glühwein, and we drank. “It’s a little crazy that we can’t find the museum,” Deb said. We spread the map out on the table. “I can’t believe I have a degree in city planning,” I said. We started giggling. It was bad enough when it was just me in a sea of Germans blundering through the city, but now here I was with someone who shares my DNA, my whipsmart little sister with her three years of college German and years of international travel under her belt, drinking Glühwein and giggling with me at the absurdity of how lost we were in one of the most touristy spots in Berlin. “Come on, we can find this place,” I said. We stared at the map. “We need to find the Marx-Engels Forum,” said Deb. I looked around. The word “Engels” was written across the top of one of the wooden huts. She snorted. “That means angels,” she said, and now I saw that there was an angel ornament swinging from a string just below the sign, and we chuckled some more. “Karl Marx…” Deb mused, “Was he one of the Marx brothers?” And then immediately smacked her own forehead for the slip, and she descended into further giggling, appalled that her years of political science had allowed such a lapse in sanity. The Glühwein had kicked in, clearly. The Germans nearby eyed us warily, but none approached. We were on our own to find our way out of here. “Look, there’s some sort of Neptune circle on the map,” said Deb. “If that’s Neptune,” she said, pointing to the ice skaters, “then I know where to go,” and she took the glasses back to the Glühwein station. I walked over to the small skating rink and saw that the children were skating around, indeed, a sculpture of a man with a trident. Neptune. We knew where we were on the map. “OK! Then we go this way,” Deb said, and I followed her, but the wooden huts were scattered in curving lines, and by the time we reached the street we had crossed the park and ended up on the wrong street. We just needed to get to the next light, but there was construction on the street so we had no choice but to walk through the Christmas Market again, past the donkeys, past the cheap trinkets and silver jewelry and mountains of hats, to the other corner, which was indeed the correct street. We crossed with the light as you must always, always do in Berlin; there is too much traffic to do otherwise, and went halfway down the long block when we saw an unmistakable sign for the DDR Museum… on the other side of the busy street. It was a long way back to the corner but even further to the next intersection, so we retraced our steps through the wind to the stoplight, warmed by having our destination in sight and Glühwein in our systems. We found the canal, the steps leading down to the outdoor promenade, and the welcoming lobby of the DDR Museum, where we shed our coats in the warm space and were glad to explore, for the next few hours, the crazy, mixed-up world of life in East Berlin in the years behind the Wall. This entry was posted in Getting lost, History and culture and tagged Alexanderplatz, Berlin, DDR Museum, East Berlin, Glühwein, TV Tower, U-Bahn, Weihnachtsmarkt on December 9, 2013 by Jill M..
haha, love the weihnachtsmarkt/st.paul-comparison 😀 very accurate! oh yes – the holidazzle almost killed me 😉 way to cold! but there’s glühwein to get warm! oh. *too cold. touchscreen + sausage finger! Looks like an off grid surprise can be fun. Bailey pointed me to these. Well-done! I can see every step. I hope you are enjoying Berlin. Will, thanks for reading. I appreciate your comments. We are definitely enjoying Berlin. I hope you are able to make the most of the Minnesota winter. Make it! Wish we could join you. Have fun with J&D!! Saw this title at the time but didn’t have a chance to read it. I love those Christmas markets. I have friends who have made December Germany visits anchored around visiting Christmas markets in lots of different cities. We just returned from Christmas in Spain (oldest daughter just spent a semester in Seville). 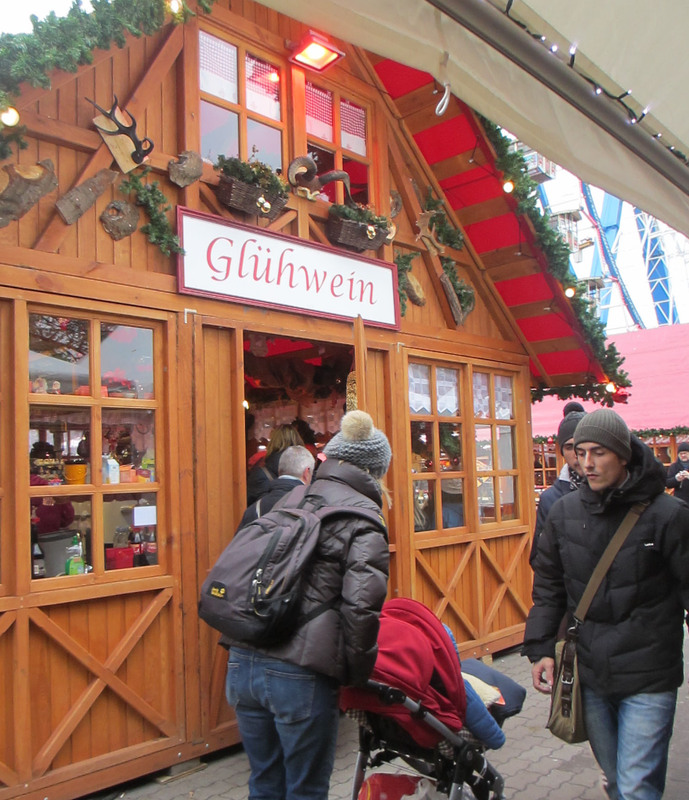 We were surprised to find Christmas markets there — however no Glühwein. Though probably warmer than Berlin, it would still hit the spot there! Aren’t Christmas markets great? I hear there are a few of them in the US, but not like here, where you can find them in almost every neighborhood. Glad you found some in Spain, but sorry there was no Glühwein. That seems pretty critical to the whole thing. Hope your daughter enjoyed Seville. Best wishes. I’m glad to hear you think it’s confusing too, because it’s a platz, a square, which just doesn’t sound like it could be disorienting, yet it is.